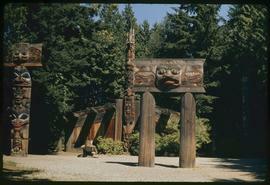 Image of totem poles, canoes, and longhouses(?) in the Nass River valley of BC. File consists of photocopied excerpts from the <i> Bella Coola Indians </i> manuscript. 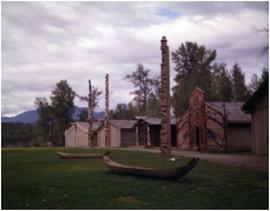 (Replica) Haida house front and poles #14, 15, 16 + 17, Thunderbird Park, Victoria, B.C. 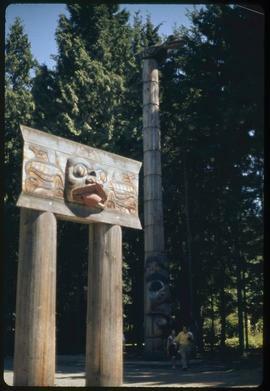 (Replica) Haida mortuary pole, Thunderbird Park, Victoria, B.C. 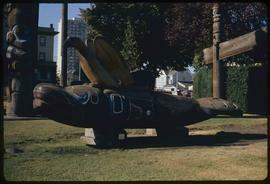 (Replica) Haida thunderbird and whale #16, Thunderbird Park, Victoria, B.C. 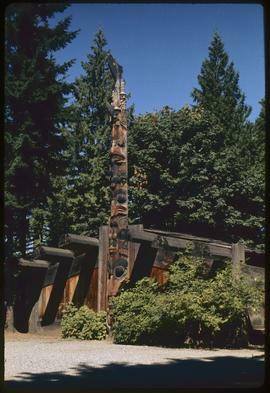 (Replica) Kwakiutl housepost #5, Thunderbird Park, Victoria, B.C. 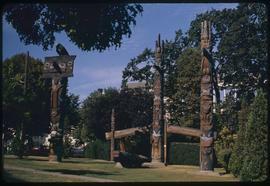 (Replica) Tsimshian and Haida memorial poles #9, 10, 13, 14, 15, + 17, Thunderbird Park, Victoria, B.C. 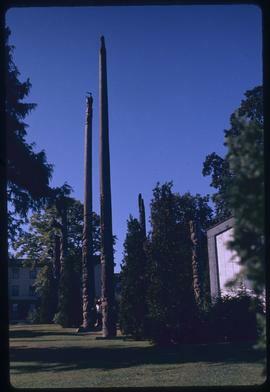 (Replica) Tsimshian memorial poles #9, 10, Thunderbird Park, Victoria, B.C. 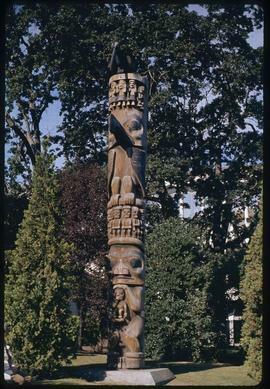 Mortuary House frontal pole by Bill Reid and Doug Cranmer (1960-61) moved from Totem Park to MOA in 1978. 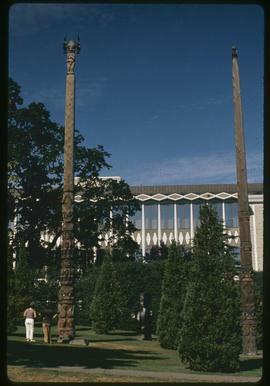 Double mortuary pole by Bill Reid and Doug Cranmer (1960-61). 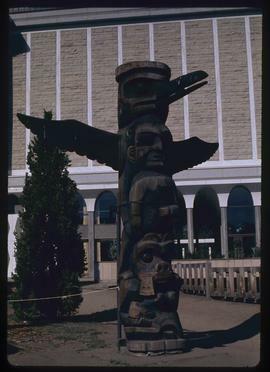 Moved from Totem Park to MOA in 1978. 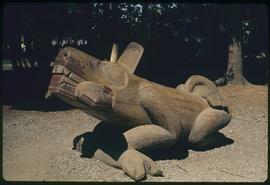 The Wasgo is a monster of Haida legend that had the ability to transform between wolf and sea creature. 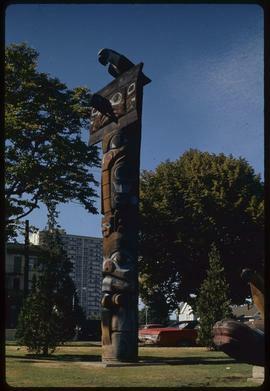 Carved and painted by Bill Reid and Doug Cranmer in 1962. Image depicts Doug Cranmer taking a break from carving. 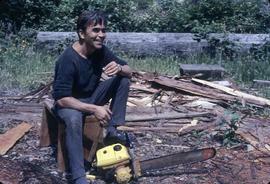 He sits on a wooden stool with his chain saw at his feet. 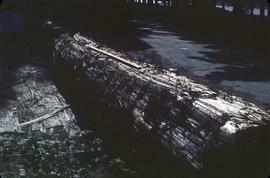 Image depicts a felled tree which will possibly become a totem pole. The collection consists of postcards depicting First Nations from Western Canada. 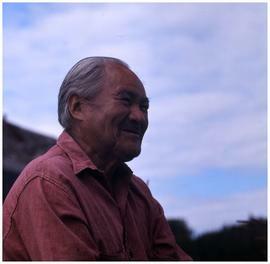 Portrait of Able Derek, Nisga'a. 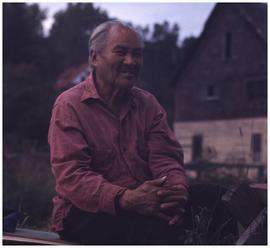 A similar portrait of him is printed on page 136 of Carter's book Abundant Rivers, with the caption: Abel Derek at Gitlakdamix, now called Old Aiyanch 'I am just a common man.'"